The first campaign I ever worked on was a Dr.Pepper UK magazine campaign with the strapline 'Pull One Get One Free.' The magazine campaign was based on display pages, but Dr.Pepper were receptive to ideas to improve cut through / stand out. Front magazine ran with a hole in the 'O' on the front cover which, up until this point, was used by editorial to highlight something on the contents spread on pages 2 and 3. We re-sized the creative to fit the hole and the central Dr.Pepper character from our campaign then had his face on the magazines' front cover! 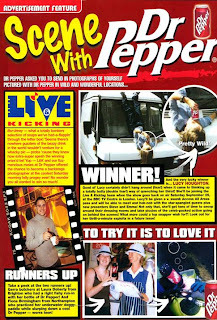 We also ran a promotion with Live&Kicking and Top Of The Pop's magazines - offering behind the scenes passes to the shows. 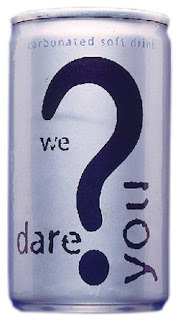 Based around User Generated content (nearly 10 years before it became de rigeur), the competition asked readers to send in images of themselves in unusual situations with a Dr.Pepper. Launched with a half page and reprised with a full page, this Dr.Pepper competition had over 10,000 entries! There were also around 50,000 unbranded sample cans left from various Dr.Pepper PR events over the summer. These were unbranded (working in line with the Dr.Pepper 'to try it is to love it' idea) and as part of our promotion we were able to negotiate that these cans were included as samplers in the magazines' polybags. This was the first time a soft drink had sampled in this way and the cans worked well alongside our competition. What I noticed was that u have been blogging for over a decade now. Blogger is less than a decade old. Did u migrate ur older posts from some other platform?